The Space Race was a rivalry between the Soviet Union and the United States of America for dominance in space exploration and Atomic technology. Some of the greatest advances in space exploration developed during this time period including the first satellite in space Sputnik 1, the first manned space flight, the first color photographs of the planet earth from space, and the first man on the moon. All these events were covered by the mass media on both television and radio documenting some of the most important events in human history. 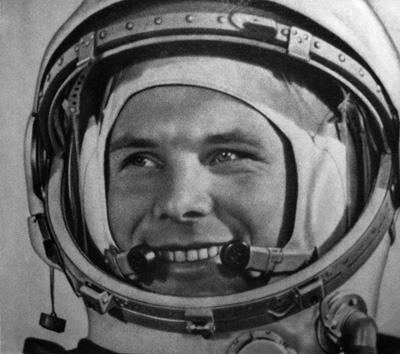 America was eager to enter the space after we had been beaten into space by the Soviets twice; first on October 4, 1957 when the Russians launched Sputnik 1, and again on April 12, 1961, when cosmonaut Yuri Gagarin became the first man in space. 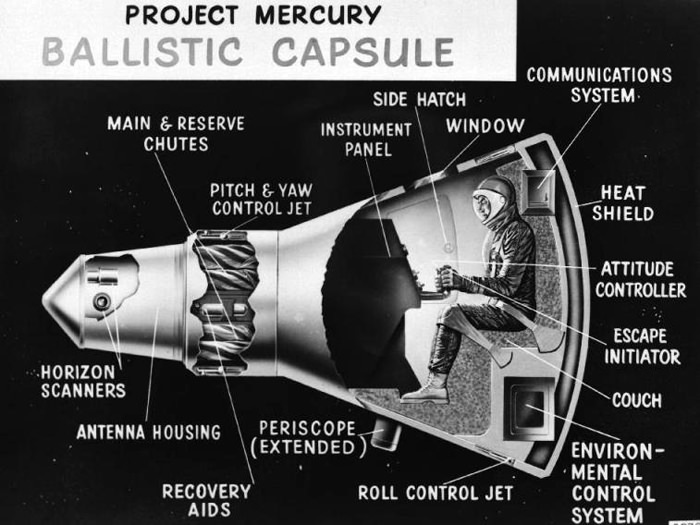 NASA's Mercury program was planned with the goal of launching a man into orbit, as well as investigating man's ability to function in a weightless environment, and the ability of both the man and machine to be recovered after the flight. The Mercury Seven Astronauts, more formally Astronaut Group One, were introduced by NASA in Washington, DC, on Apr 9, 1959. All had endured a lengthy selection process consisting of intense physical and psychological testing. 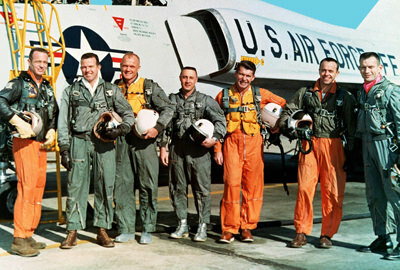 All were experienced Military Test Pilots, they stood less than 5'11" and weighed less than 180 pounds in order to fit into the planned spacecraft (several NASA personnel quipped that the Mercury capsule was worn, not ridden), had a Genius or greater IQ level, and had demonstrated an ability to work well individually and in a team setting. After Gagarin's flight there was increased emphasis on the success of the Mercury program. 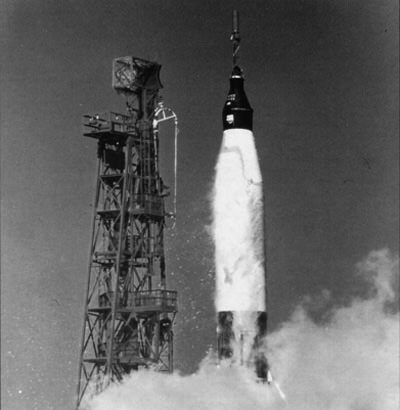 The program had been plagued by technical problems during the unmanned test launches, including the Mercury-Redstone 1, which lifted 4 inches off the launch pad when the main engine quit due to an electrical failure. Mercury-Redstone 2 carried the chimpanzee Ham. Although the mission was considered a success, control problems resulted in the capsule over accelerating and overshooting the recovery point by more than 60 miles. The name of the pilot of the first Manned flight was not announced until a first attempted launch had been canceled. 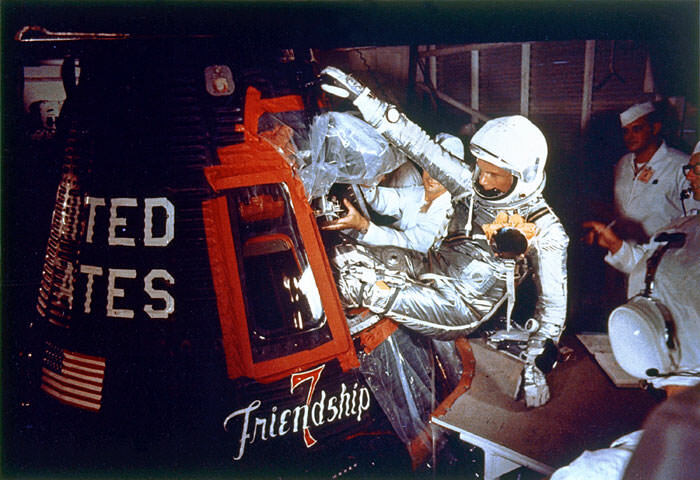 Astronaut Alan Shepard named his spacecraft Freedom 7. His flight lasted 15 minutes and 28 seconds, traveled 302 miles, reached an altitude of 116.5 miles and a top speed of 5,180 mph. TV Feed while the count down goes on for Shepard's flight, Bob Cochran in New York explains that Live coverage will not commence until "T Minus Ten", 10 minutes before launch. While waiting there is discussion of astronaut selection and training. There is also an over view of the Mercury capsule. Walter Cronkite at Cape Canaveral beginning T minus 10, going through the flight and recovery aboard the USS Lake Champlain. CBS report from later in the week recapping the flight and the mission. Transmissions from Friendship 7 are reported by NASA spokesman,Lt Col Shorty Powers,"the Voice of Mercury control." The flight of Mercury-Redstone 3 was considered a complete success. Post-flight inspection of the Freedom 7 capsule determined that it was in good enough shape for another mission. The capsule is on display at the US Naval Academy in Annapolis, Maryland. Virgil I. 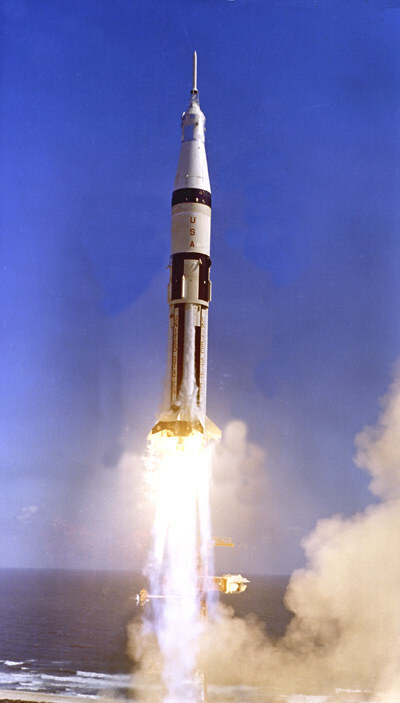 "Gus" Grissom's mission was planned as a repeat of the flight of Freedom 7. Grissom's capsule, which he named Liberty Bell 7, had several improvements over previous capsules. Attitude controls had been improved to allow more precise control of the spacecraft in flight. A central window replaced the two small port holes, giving the astronaut a much better view. Finally, an emergency escape hatch with explosive bolts was fitted. In the original design of the Mercury capsule, astronaut egress was intended to be through the top of the spacecraft through the antenna compartment, the side hatch was secured with 70 bolts. The emergency hatch could be released by the astronaut inside the spacecraft by depressing a knobbed plunger on the hatch, or by personnel outside the capsule pulling a lanyard. The flight had been scheduled for July 16, 1961, but was canceled due to heavy cloud cover. The launch was rescheduled for Jul 18, and again scrubbed due to weather. In both cases Grissom had not boarded the spacecraft, but he was aboard on Jul 19 when the flight was canceled 10 minutes and 30 seconds before launch. 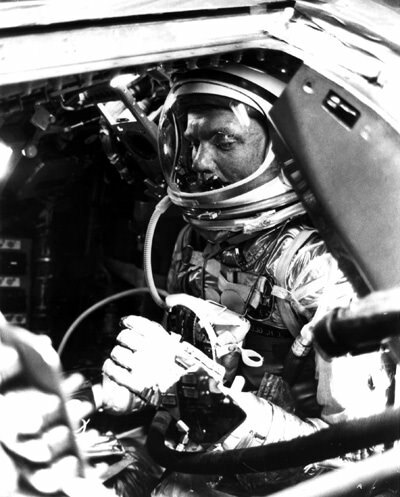 Grissom entered his capsule at 0858 UTC and the hatch was secured. There was a delay 45 minutes later when it was discovered that one of the hatch bolts was misaligned, but it was determined that the countdown could continue 30 minutes later. The launch and flight of Liberty Bell 7 went well, although Grissom later indicated that he was slightly overwhelmed with his work-load and the view. Television coverage of the flight from count-down through Grissom's arrival of the USS Randolph. Col. Powers informs the press that after landing in the ocean, when the recovery helicopters arrived on scene, Astronaut Grissom asked the recovery crew to wait while he finished his flight check-list. While he completed the list, which was difficult wearing the gloves of his space suit, the explosive hatch suddenly blew open. The sea began entering the capsule, and Grissom left the capsule. The astronaut's space suit was designed to keep him afloat, but he had neglected to close the ventilation inlet valve on the suit, and it began to fill with water. 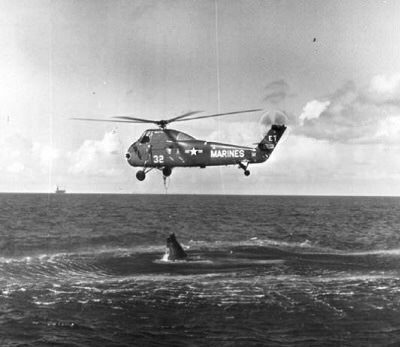 The helicopter had attached to the capsule, but was unable to lift it because of the load of sea water (flooded, the Liberty Bell 7 weighed 5000 pounds, 1000 pounds more than the helicopter's lifting capacity). With insistent warning lights indicating imminent engine failure, the pilot was forced to release the capsule which immediately sank. 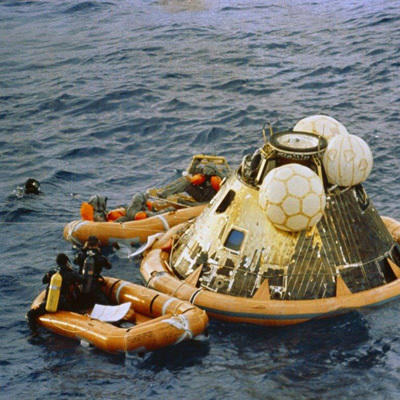 Grissom was floating lower in the sea because of the water in his spacesuit, but was recovered. Continued coverage from Cape Canaveral as Grissom is recovered from the Atlantic. The last part of the recording features Grissom describing the flight at a press conference. Gus Grissom insisted that the hatch detonated without his authorization, although many engineers insisted that this could not have been possible. NASA finally accepted Grissom's story. It was determined that activating the explosive hatch from within the capsule would have left a distinctive injury on the astronaut's hand. Grissom's hand was uninjured. At the end of Wally Schirra's flight in Mercury-Atlas 8 on Oct 3, 1963, the astronaut deliberately remained in the capsule until it was secured on the deck of the aircraft carrier. At that time Schirra activated the explosive hatch. His hand was bruised. Grissom went on to command the first manned Gemini flight and was assigned as command pilot for Apollo 1. Grissom was killed in a launch pad fire with his crew on Jan 27, 1967. The dress rehearsal for the first US Manned orbital flight was Mercury-Atlas 5, "manned" by Enos, a chimpanzee, on Nov 29, 1961. Television coverage of Enos's flight from countdown through post-flight Press-conference. The Chimpanzees had been chosen for the rehearsal flights because of their ability to perform the same sorts of tasks the human astronauts would be doing in the spacecraft. Enos was from a group trained by the Air force for the flights. 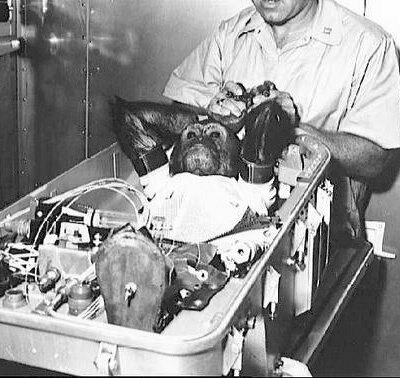 Enos received more intensive training than had Ham, the chimp who made the sub-orbital flight on Mercury-Redstone 2, Jan 31, 1961. Ham was one of Enos's back-ups. The flight had been scheduled for three orbits. During flight one of the capsule's stabilizing thrusters failed, and the automatic stabilization system began using excessive fuel to correct the problem. While the medical team gave a "Go" for a third orbit, Flight Director Christopher Kraft gave the order for the retro-rockets to be fired to end the flight after the second orbit. It was the opinion of most analysts that the third orbit would have been allowed had there been a human at the controls of the capsule. After the late November rehearsal flight by Enos the chimp, NASA officials had hoped for a December launch for MA-6. This would allow the US to have their first Orbital flight in the same year as Yuri Gagarin's Soviet flight. It soon became apparent that the hardware would not be ready until early in 1962. An initial launch date of Jan 16 was announced, but delayed until Jan 23 because of problems with the rocket's fuel tanks. The Jan 23 launch was postponed day by day because of bad weather until Jan 27. At T minus 20 minutes, with Glenn aboard the rocket, the flight director scrubbed the launch do to heavy overcast, postponing the launch until Feb 1. While the rocket was being refueled on Jan 30 it was discovered that fuel had soaked the insulation between the fuel and oxidizer tanks, necessitating another two week delay for repairs. The Feb 15 launch date was delayed again for weather, the weather began to break on the 19th, with the 20th looking very favorable for launch. After Glenn entered the capsule it was discovered that one of the hatch bolts was broken. The count-down was held for 42 minutes while the hatch was removed and the bolts replaced. Glenn in contact with Gordon Cooper in Muchea, Australia, marvels at how fast the sun sets and rises in orbit. MA-6 "Firely on a Dark Night"
Moving across night time Australia nad the western Pacific, Glenn came in contact with the Canton island tracking station. At this time he reported seeing tiny particles outside the space craft which he likened to fireflies. It was later supposed that the luminescent particles were ice crystal that were venting from the spacecraft which were reflecting the morning sun. Near the end of his first orbit, Glenn noticed that he the automatic stabilization and control system was drifting, allowing the spacecraft to yaw slightly. He made the corrections while crossing over the Pacific Coast of North America while monitoring his fuel consumption. The manual "Fly by Wire" system used the least amount of fuel, and he remained in that mode for the rest of the flight. 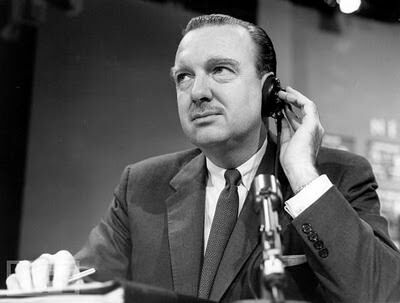 Walter Cronkite reporting on CBS TV, from the time Friendship 7 crosses over the Indian Ocean on the first orbit. There is a description of Glenn taking a some food for the first time, and a report from the White House as President Kennedy watches the coverage. As he crossed the west coast of Australia Glenn thanked the citizens of Perth who had turned on all the lights in the city so they could be seen from space. The clip ends with comments from Yuri Gagarin. MA-6 "Landing Bag Signal Test"
At the beginning of the second orbit Mission Control noticed an alarm indicating that the Landing Bag had deployed. Mission Control was certain this was an erroneous reading, but was still concerned, and passed to the tracking stations to watch for the signal. Glenn was not aware of the fault, but became suspicious as the tracking stations asked about it in turn. As Friendship 7 crossed Australia on the second orbit another alarm indicator lit, showing that the fuel for the maneuvering thrusters had dropped below 62%. Mission Control recommended that the capsule be allowed to drift for the remainder of the flight in order to conserve fuel. However Glenn continued to make manual corrections, which used more fuel than the automatic system would have. While flying over the Indian Ocean Glenn's spacesuit became uncomfortably warm. While trying to adjust the temperature he received an indication that cabin humidity had become excessive. 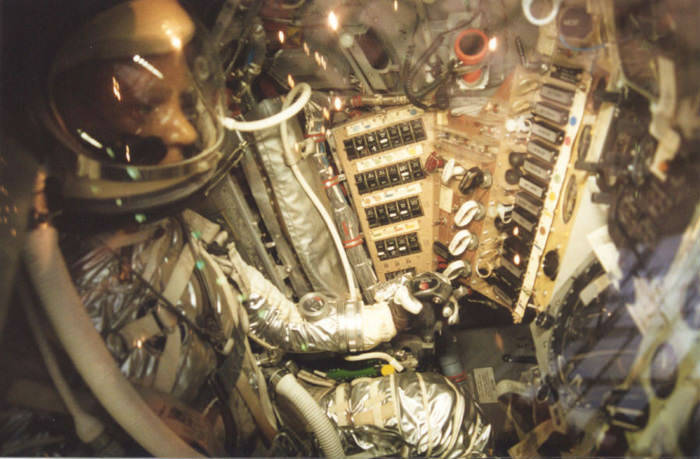 The astronaut had to carefully balance suit temperature and cabin humidity for the rest of the flight. Passing over Australia for his third and final orbit, Glenn joked with Gordon Cooper that three orbits should count as the four hours minimum flight time required for monthly flight pay for the Marine Corps, and would Cooper inform General Shoup, Commandant of the Marine Corp.
MA-6 "Leave Retro Pack On"
Still concerned about the Landing Bag Deployment Light, Mission control considers the possibility of leaving the Retro Package in place through reentry. It was decided that the Package would not interfere with reentry, whereas if the heat shield were lost, the capsule would burn up as it reentered the atmosphere. Astronaut Glenn is surprised by the force of the retro-rockets. Communications were temporarily lost as the capsule reentered the atmosphere. CBS TV coverage from the crossing of the West Coast of the US during the third orbit through splash-down and recovery on board the destroyer USS Noa. As John Glenn was exiting the capsule on the deck of the USS Noa, a cake was rolled into Hanger S at Cape Canaveral. The cake, a present to the NASA Team from the owner of the local Holiday Inn, was a life sized replica of Friendship 7,and weighed 980 pounds. 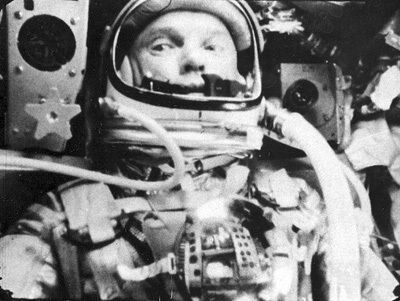 The first Soviet Manned Space flight on April 12, 1961, rekindled fears of America being left behind in the military and technical race that was developing between the two superpowers. Many senators began calling for a crash program to get an American into space. Kennedy gave Vice President Johnson the assignment of investigating the current programs to see which would give the US the best chance of "catching up". Johnson concluded that "we are neither making maximum effort nor achieving results necessary if this country is to reach a position of leadership." Johnson further recommended that the effort to land a man on the moon was not only technically feasible, but far enough in the future that the US had a good chance of achieving it first. JFK: "New Course of Action"
JFK: "We Choose to go the Moon"
Kennedy announces the plan to put a Man on the moon before a joint session of congress on May 25, 1961, soon after Alan Shepard's flight about Freedom 7. He made his "We choose to go to the moon" speech at Rice University on Sep 12, 1962. Flying to the Moon was something that no one knew how to do. The remainder of the Mercury Program, Gemini, and the first flights of the Apollo program can be seen as rehearsals or training for the Apollo 11 mission. There were various techniques considered. The first was "Direct Ascent" where the spacecraft would fly directly to the moon, land on the surface, and then return to the earth. This would have required a much heavier and complex vehicle. A minority of scientists and engineers called for "Lunar Orbit Rendezvous". This called for two spacecraft, a Command/Service Module and a Lunar Excursion Module, to be launched from the earth using the same booster. They would separate with LEM landing on the lunar surface, then returning to lunar orbit to rendezvous with the Command Module. After the LEM crew returned to the Command Module the LEM would be discarded. Finally the only part that would return to the Earth would be the Command capsule. 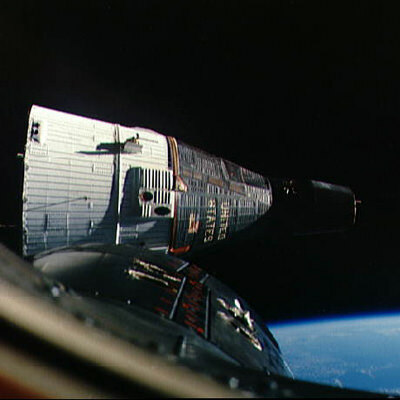 The techniques of rendezvous and spaceship docking were developed and learned during the Gemini missions, along with Extra Vehicular Activity (EVA). EVA, or "spacewalking" proved that men could work outside of their spacecraft. The space program had a major setback with Apollo 1. Intended to be the first manned flight of the Apollo-Saturn system, the mission came to a tragic conclusion just over three weeks before the scheduled launch. On Jan 27, 1967, the crew was conducting a "plugs out launch simulation". This test would prove that the space craft could operate on its own power, and was critical for the Feb 21 scheduled launch. The flight crew were strapped in the capsule with the hatch locked when an electrical fire broke out. 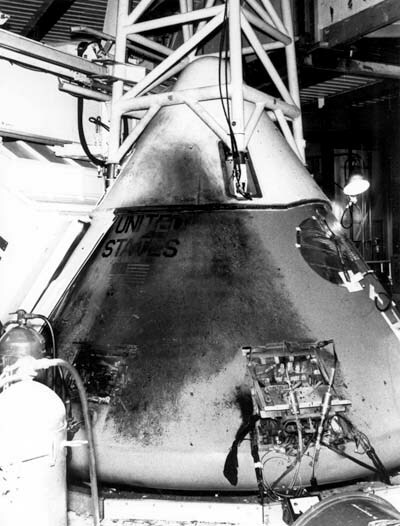 Because the capsule was pressurized with a pure oxygen atmosphere the fire quickly consumed all the flammables in the capsule, and the crew was killed. 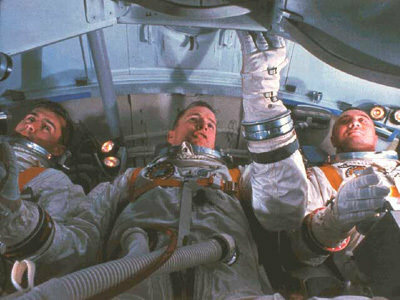 Astronauts Gus Grissom, Ed White, and Roger Chaffee were unable to open the hatch from the inside because of cabin pressure, and ground crew were unable to get the crew out before they were killed, hampered by gas masks that were not designed for the heavy smoke from the fire. As a result of the fire the Apollo capsule was redesigned and several procedures were revised. America would not have another space flight fatality until the Challenger explosion in 1986. Apollo 10 was a dress rehearsal of the actual moon landing. The Command Module had been named Charlie Brown and the Lunar Module Snoopy by their crew. Snoopy approached within 8.4 nautical miles of the lunar surface. The Ascent Stage of the Lunar Module was deliberately short fueled, because of fears that if the crew could land on the moon they would. PreLaunch coverage on CBS TV, includes description of the VIPs who have come to see the launch, the people on the beach to watch the launch,taped interviews and biographies of the astronauts, including Deke Slayton, who had been grounded during the Mercury Program but went on to become "Director of Flight Crew Operations". Apollo 11 was crewed by Commander Neil Armstrong,Command Module Pilot Mike Collins, and Lunar Module Pilot Edwin "Buzz" Aldrin. They named their spacecraft Columbia, after the feminine personification of the US, and Eagle. The launch was surrounded by a good deal of excitement by the public. Thousands crowded the Highways and beaches around Cape Canaveral to see the launch. At 9:32 am, local time, on Jul 16, 1969, the Saturn V rocket fired, launching the spacecraft from Launch Pad 39A. After one and a half orbits of the Earth the third stage rocket fired, pushing the spacecraft into its trans-lunar trajectory. About a half hour later the Command Service Module pulled away from the last of the booster rocket, pitched 180 degrees, and returned to dock with the Lunar Module. After three days of travel to the moon, the spacecraft passed behind the moon and fired its service rocket for injection into lunar orbit. On Jul 20 Eagle separated from Columbia. Command Pilot Collins made a visual inspection of the LM before it made its descent. During the descent the crew found that they were spotting landmarks 4 seconds prematurely, and reported that they would be landing miles beyond their target. In the last several hundred feet of the descent the LM's navigation and guidance computer began to give "1201 and 1202" alarms. The alarms basically indicated that the computer was being overwhelmed. It was later believed that a switch was in the wrong position, causing the computer to analyze data from two radar sets instead of one. At this point Armstrong looked out the window of the LM and realized the computer was targeting a boulder field. He took semi-automatic control of the landing with Aldrin calling out velocity and altitude data, and successfully landed with 25 seconds of fuel remaining. The Mission Schedule called for a five hour sleep period after landing on the moon. It was felt that they would have been fatigued from the landing because they had been working since early morning. However they realized that they would not be able to sleep, and began their preparations for egress early. Preparations took longer than the two hours alloted. Through the triangular windows of their LM, the astronauts determined where they would place their Science Package monitors and the Flag. The hatch on the LM had been made smaller in a design change, but the Life Support backpack had not followed the redesign. 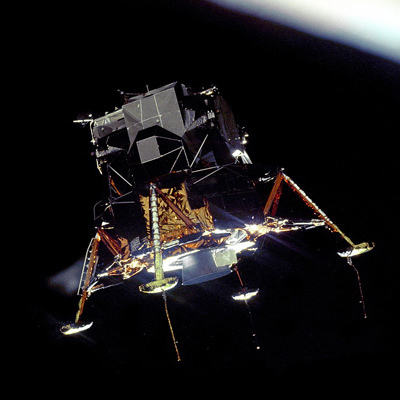 The highest heart rates noted during Apollo missions was during access and egress to the LM. 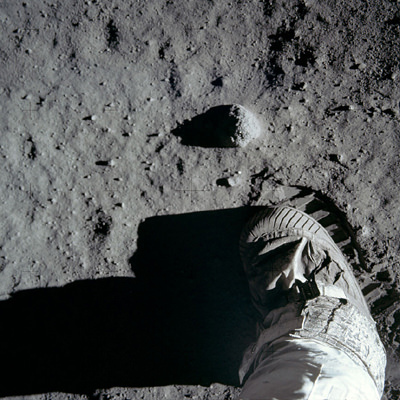 When Armstrong reached the base of the LM ladder he paused, described the lunar soil, and then placed his left foot on the lunar surface. 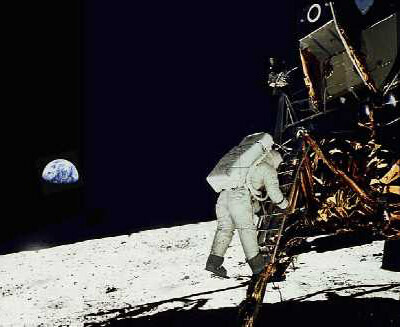 Television signal from the outside of the LM was via a slow scan camera mounted on the Modular Equipment Storage Assembly which Armstrong deployed as he went down the ladder. The slow scan camera was incompatible with commercial television broadcast, so a TV camera was placed in front of a slow scan monitor, which partially accounts for the ghostly black and white images of the first Moonwalk. The astronauts were slightly thrown off balance by their bulky life-support backpacks. They soon found a looping stride, which they compared to a kangaroo hop, to be the most efficient means of getting around on the moon. The fine dust of the landing area made footing somewhat slippery, and the astronauts noted the need to plan their movements six or seven steps ahead. One of Armstrong's first tasks while on the lunar surface was to collect a "contingency sample". A long handled scoop was part of his kit; he gathered a sample of the lunar soil and then placed it in a pocket of his space suit. If for some reason the astronauts had to cut their moonwalk short, this sample was expected to make it back to the Earth. President Nixon calls the astronauts on the moon from the Oval Office, where he was watching the moonwalk on television. Nixon had apparently prepared a lengthy speech for his conversation with the astronauts. Astronaut Frank Borman, who had commanded Apollo 8, was at the White House as a liaison. 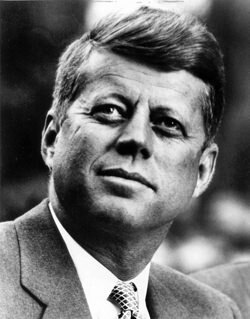 He is credited with convincing the President to cut down the speech out of respect for the Lunar landing being Kennedy's legacy. 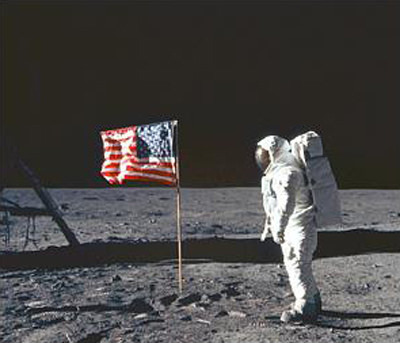 A plaque commemorating the landing was left on the moon along with other mementos. These included, along with the scientific equipment, a gold olive branch as a symbol of peace, the American Flag, a silicon message disk containing Good Will messages from World Leaders, Soviet medals for Cosmonauts Komarov and Gagarin, and a diamond studded astronaut pin to commemorate Deke Slayton, the grounded astronaut. The flight surgeons determined that both of the astronauts' metabolic rates had remained below expected levels and a fifteen minute extension to the moonwalk was granted. Aldrin then entered the Lunar Module and the astronauts began loading and stowing their samples. Once Armstrong joined him and they were attached to the LM's life-support system they lightened the load by jettisoning their life-support backpacks, a camera, their lunar overshoes, and other equipment. The LM was then pressurized and the astronauts began a rest period. During this rest period, another chapter of the US-Soviet Space race came to a close. While Apollo 11 was making its trans-lunar travel, on Jul 17, the Soviet Lunik 15 entered lunar orbit. 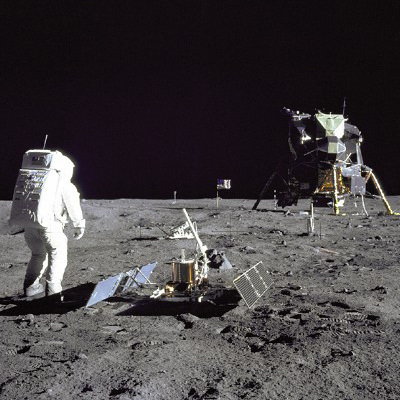 The reasons for the probes mission were open to speculation by the West; some thought its mission was to return samples ahead of Apollo 11, other believe that it was intended to observe the American Moon Landing. In a rare example of international cooperation in space, the Soviets provided NASA with Lunik 15's flight plan to prevent the possibility of collision. While the American astronauts enjoyed the rest period after their moonwalk, the probe's retro-rockets fired for descent to the lunar surface. Four minutes later communication was lost with the probe, and it crash in Mare Crisium. While moving in the cramped cabin of the LM, Aldrin broke the breaker switch that was to supply power to the launch-stage main engine. Failure of this switch would have stranded them on the moon. Luckily, the lid to a felt-tipped pen was used to activate the switch. 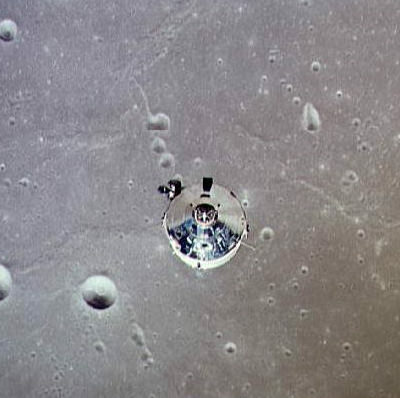 Eagle and Columbia rendezvoused in lunar orbit. Eagle was then jettisoned at 7:41pm, EDT, on Jul 21, and the crew began their journey home. Just prior to splash-down the Guam Tracking Station failed and was unable to be repaired. This would have made communication with the capsule impossible through much of the reentry, but repairs were made in time by a Station technician's 10 year-old son, whose hands were small enough to make the delicate repairs. Splashdown took place on Jul 24 in the Pacific Ocean, 1440 miles East of Wake Island. Armstrong made his last official transmission from Columbia: "Everything's okay. Our checklist is complete. Awaiting swimmers." After boarding the USS Hornet the astronauts began a 21 day quarantine in case they had been exposed to unknown pathogens on the moon. President Nixon flew out to the carrier to personally great them. At the end of the quarantine they were greeted by great celebration of their feat. The Apollo 11 Command Module is on display at the Nation Air and Space Museum in Washington DC. The landing site in the Sea of Tranquility was photographed by the Lunar Reconnaissance Orbiter in 2009. The LM Descent Stage and the astronauts foot prints are clearly visible. Six more Apollo flights were made. Each, with the exception of Apollo 13, landed two men on the moon. The Apollo equipment was used in the Skylab program as well as the Apollo-Soyuz Test Project. No Human has flown past low-earth orbit since Apollo. Be the first to comment on "Space Recordings"